St Declan founded the monastery at Ardmore, Co Waterford (Aird Mhór in Irish, meaning “Great Height”) prior to the arrival of St. Patrick in Ireland, although there is dispute of the dates usually given for Declan’s life (between 350 and 450 A.D.). Nevertheless, Ardmore is believed to be one of the oldest monasteries in Ireland. Declan converted the people of the Decies, an ancient principality of southern Ireland, to Christianity. The cathedral (really a church in the modern sense) at Ardmore, built over the site of the original monastery, has features dating from as early as the 9th Century. 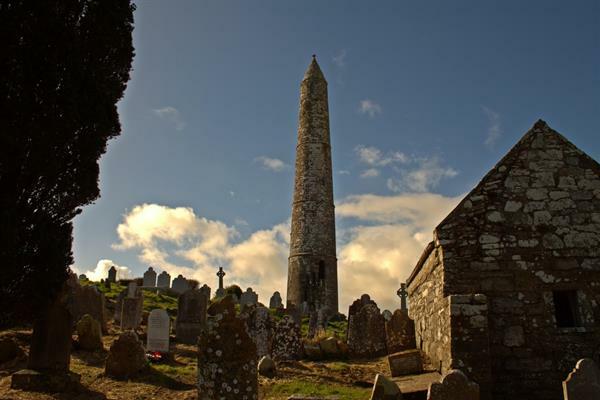 The round tower at Ardmore was built in the 12th Century and raises its tapering form to a height of 97 feet. It is divided into four stories. The entrance doorway is a little over 13 feet from the ground, making the tower a refuge for the monks and a safe place for their books, chalices, and relics. St Declan’s Oratory is the oldest building in the graveyard near the Cathedral. Tradition has it that the grave of St. Declan is located within the building. St Declan’s Hermitage, consisting of his well and church, is situated near the beginning of the cliff walk around Ram Head above the town of Ardmore. The well served as a Bapistry to the early Christian missionaries, while the church served as his hermitage where he retired for greater seclusion. According to legend, St Declan’s Stone, located on the beach at Ardmore, was carried by the waves from Wales following his visit there. Every year on his feast day, locals and people from the region celebrate his pattern, which includes various devotional acts at sites associated with his life. Devotees drag themselves through the hollow between the two suppotrting points holding up the stone in the belief of receiving health or spiritual benefits. St Declan’s Way is a pilgrim route that begins in Ardmore and ends in Cashel in County Tipperary. It is 56 miles in length and crosses the Knockmealdown Mountains via a high 1,762 foot pass.